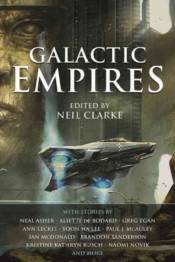 From E. E. "Doc" Smith�s Lensman, to George Lucas� Star Wars, the politics and process of Empire have been a major subject of science fiction�s galaxy-spanning fictions. The idiom of the Galactic Empire allows science fiction writers to ask (and answer) questions that are shorn of contemporary political ideologies and allegiances. This simple narrative slight of hand allows readers and writers to see questions and answers from new and different perspectives. At the beginning of the twentieth century, writers such as Kipling and Twain were at the forefront of these kinds of narrative observations, but as the century drew to a close, it was writers like Iain M. Banks who helped make science fiction relevant. That tradition continues today, with award-winning writers like Ann Leckie, whose 2013 debut novelAncillary Justice hinges upon questions of imperialism and empire.